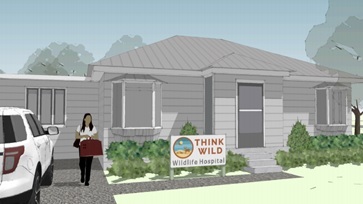 BEND, OR -- A new wildlife hospital and conservation center opens this summer, after years of planning. "We came out of an old organization that discontinued a wildlife hospital," says Think Wild Executive Director Michelle van Hilten, "And then basically, have spent the last three years planning, preparing, and building a sustainable and strong foundation to serve the community and wildlife here in Central Oregon." She tells KBND News the facility will eventually be able to care for 250 small mammals, water fowl and raptors each year, "It's set up to provide high quality of care and to keep predator and prey species separated, and then we're also going to be building wildlife enclosures, we're on four acres, so we'll be keeping wildlife throughout the four acres in their own species specific enclosures that are going to be placed with that in mind, as well as, stress reduction." Volunteers for the non-profit have already begun demolition to renovate a house east of Bend; construction is expected to be complete by June. Think Wild aims to inspire the High Desert community to understand and protect native wildlife. But, van Hilten says you should never approach a wild animal, especially if they're hurt or seem orphaned. "Just call the hotline, it's 541-241-8680, and you can call to get guidance from an expert and we can arrange transport and care for that injured animal. So, we just encourage the community to call the hotline first, before taking any action." For more information, and to get involved, visit ThinkWildCO.org.